Tópico em 'Tempo Tropical' iniciado por Gerofil 12 Nov 2007 às 21:36. Cyclone Sidr, which is a hurricane of at least Category 3 strength, could track toward Bangladesh and repeat episodes of destruction that have witnessed hundreds of thousands dying from single strong storms. It already packs winds of 120 mph, having intensified rapidly in the past 12 hours -- but the forecast is mixed for the next several days, with some projections predicting a weakening, and some a strengthening. As our Storm Pundit, Chris Mooney, points out, it has been hard to know exactly how strong, or where the storm is headed, because neither the Indian Meteorology Department nor the U.S. Navy are making frequent updates about the progress of the storm. The last word, however, just out from the Joint Typhoon Warning Center, was that the storm had rapidly gained in strength, and that it still has the potential to gain additional strength over warm waters before making landfall as a strong hurricane. Another 10 mph gain and it would be a Category 4 monster storm. The image at right is a NASA satellite image resembling a photograph, taken by the Moderate Resolution Imaging Spectroradiometer (MODIS) on NASA’s Terra satellite. The Nov. 12 image shows "the storm’s swirling clouds straddling the center of the Bay of Bengal with the eastern shores of Sri Lanka and India forming the left edge of the image. "At the time that this image was taken, Sidr was relatively small, with sustained winds estimated at 60 miles per hour, the equivalent of an Atlantic tropical storm," according to NASA. "Despite its small size, Sidr is well-formed with a dark spot near the center where an eye may be developing surrounded by tight bands of clouds." Nada bom ... Parece dirigir-se para o Bangladesh, que como todos sabem é um país que não se dá bem com cheias, grande parte do território está poucos metros acima do nivel do mar. Pobre e densamente povoado, um ciclone potente acaba sempre numa tragédia. Pertence precisamente ao Bangladesh a maior catástrofe de sempre provocada por um ciclone tropical, cerca de meio milhão de mortos, faz agora precisamente 37 anos, a 12 e 13 de Novembro de 1970. Foi o Ciclone "Bhola". O ciclone tropical SIDR (categoria 4) continua rumo á fronteira de Bengala Ocidental/Calcutá (India) e o Bangladesh. Apesar de se prever o seu enfraquecimento para Cat 1 a quando do landfall, é potencialmente catastrófico devido à precipitação nesta região baixa e densamente povoada. O SIDR oficialmente é um Cat4, mas no satélite parece-me um Cat5. Espero que estejam a levar a sério a ameaça que representa, o que nem sempre acontece nestas regiões. Falta menos de um dia para prevenir uma tragédia. Landfall previsto para a noite de amanhã no Bangladesh. Thousands of people fled their homes along Bangladesh's southern coast, as volunteers with loudspeakers went from village to village warning that a severe cyclone was approaching from the Bay of Bengal. "Where shall I go?" said a woman in Cox's Bazar, Bangladesh's main sea resort, holding her child in one hand and the rope of a cattle in the other, as they came out before dark fell. Bangladesh and eastern India went on cyclone alert on Wednesday and ships were turned back to port with the storm expected to make landfall in the next two days. 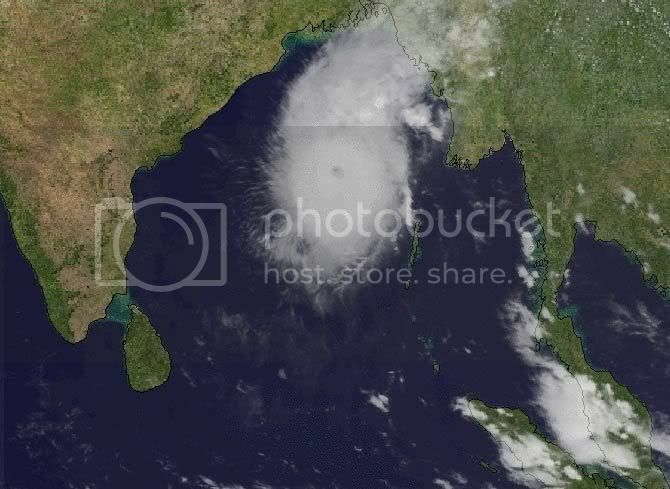 The Bangladesh Meteorological Department said the cyclone with winds of around 185 km per hour was some 850 km off the coast as of 0300 GMT on Wednesday. He said the storm was expected to hit Vishakapatnam on the eastern Indian coast as well as Sittewe in Myanmar. The British storm tracking system -- Tropical Storm Risk -- has described the storm as category 4, with windspeeds of up to 250 km per hour. It was likely to weaken to a category 3 storm by Thursday, losing some speed and ferocity, the TSR said in its latest forecast. But meteorology officials in Bangladesh said the cyclone could still be very devastating. Nearly 10 million Bangladeshis live in vulnerable points along the coast, but there are storm shelters for only half a million people, a disaster management official said. Storms batter the poor south Asian country every year, killing hundreds of people. A severe cyclone killed more than half a million people in 1970, while a 1991 storm killed 143,000 people and destroyed thousands of homes, mostly because of a devastating tidal surge. "This is a very serious cyclone," said B.P. Yadav, director of the India Meteorological Department, adding that he expected the storm to cross the coast of Bangladesh and the neighbouring West Bengal by Friday morning, near Sagar Island. Operations at Bangladesh's main Chittagong port were suspended and hundreds of ships and fishing boats returned to the shore on Wednesday. "We have suspended loading and unloading of cargo on the mother vessels at the outer anchorage as the sea has turned turbulent," a port official said. Many people living on the coastline near Chittagong have begun to vacate their homes, carrying supplies of food, drinking water and other belongings. Bangladesh's tourists resorts, Cox's Bazar and Kuakata, wore a deserted look on Wednesday and hotels were largely empty, officials and witnesses said. Volunteers of the Cyclone Preparedness Centre started moving through villages, alerting people on loudspeakers at all vulnerable places. "A severe storm is coming. Please get ready to move your families to shelters or anywhere away from the shores," one volunteer told villagers at Charkashem in Patuakhali district. Indian officials said Kolkata should expect to be hit by "squally winds and heavy rainfall". The neighbouring state of Orissa would also be affected. Indian and Bangladeshi authorities ordered thousands of people to evacuate as Tropical Cyclone Sidr headed across the Bay of Bengal toward the coast with winds of 250 kilometers (156 miles) per hour. Sidr, a Category 5 storm, was 201 kilometers east-southeast of Kolkata at 11:30 a.m. local time today, according to the latest advisory by the U.S. Navy's Joint Typhoon Warning Center. The storm was moving north at 28 kilometers an hour. 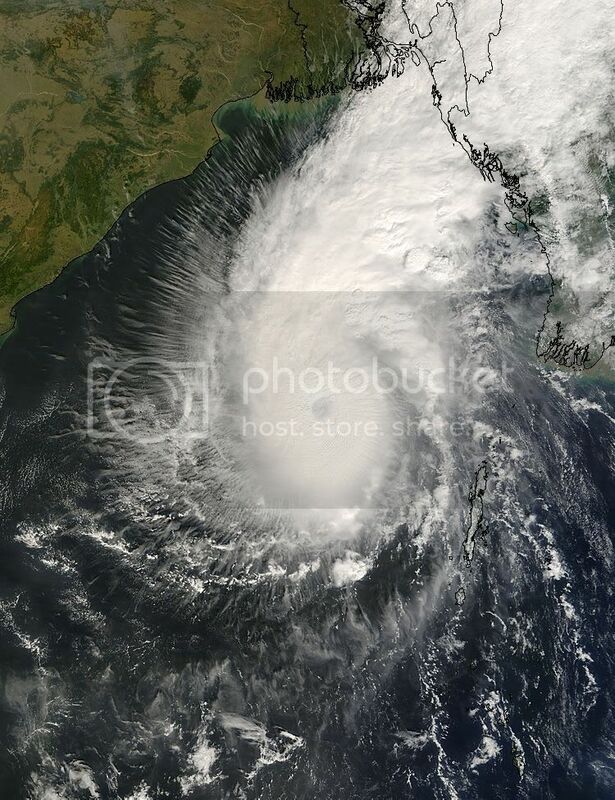 The cyclone is expected to maintain strength as it approaches the coastal border region between India and Bangladesh. Sidr's eye is forecast to make landfall southeast of Kolkata, a city of 14.3 million people formerly known as Calcutta, at about 11 p.m. today, the center said. Northeastern India and Bangladesh are regularly hit by cyclones that form in the Bay of Bengal, bringing flooding and devastation to local communities. A cyclone that hit near Cox's Bazaar in Bangladesh left 138,000 people dead in 1991, according to the New York Times. At least one fisherman was killed and about 100 others were listed as missing in the region of Cox's Bazaar after Tropical Cyclone Akash came ashore in May. 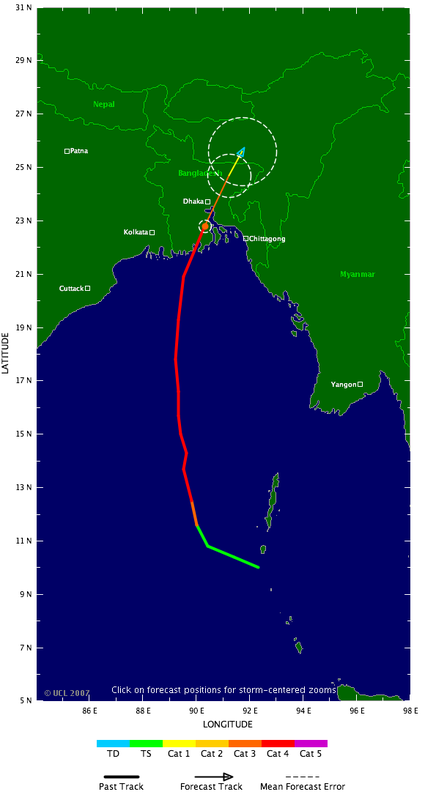 Sidr is the sixth storm of the north Indian Ocean cyclone season. Authorities ordered people to evacuate coastal areas near Cox's Bazaar, Mongla and Chittagong and issued the highest alert in sixteen districts, K.H. Massod, director general of disaster management in Bangladesh, said by telephone today. In India, authorities issued warnings to residents of Kolkata, the country's third-biggest city, and nearby coastal towns and villages. -People have been told to move to government shelters and fishermen are being told not to venture into the seas,'' Atanu Purkayastha, relief commissioner of India's West Bengal state government, said by telephone. In neighboring Orissa, four coastal districts were put on alert, K.L. Mishra, deputy general manager of the state's disaster management office, said by telephone. -Food stocks have been rushed to these districts and relief materials, such as blankets and temporary shelters, are being readied,'' Mishra said. About 9,000 people were killed in Orissa when a cyclone hit the state in 1999, he added. Sidr's winds were gusting to 306 kilometers per hour and waves in the vicinity of the storm's eye were 12 meters (40 feet) high, according to the advisory on the warning center's Web site. Hurricane-force winds of 119 kilometers per hour extend as far out as 111 kilometers from Sidr's eye, according to the Navy typhoon center. Sidr may produce a storm surge of more than 5.5 meters when it comes ashore in one of the most flood-prone areas in the world. The border area of India and Bangladesh is where the deltas of the Ganges and Brahmaputra rivers meet. 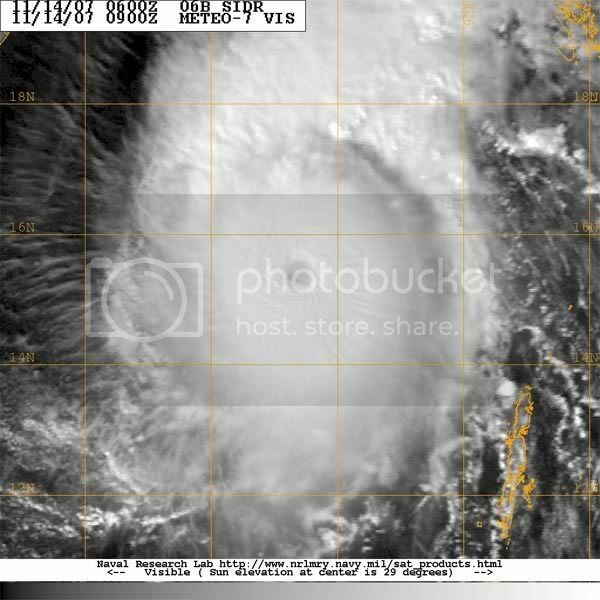 In the Indian Ocean, the U.S. Navy uses the term tropical cyclone to describe all large circular weather systems built around an area of low pressure. That differs from its conventions for the Pacific, where a three-level system is used. Cyclonic storms with winds less than 62 kilometers per hour are classified as tropical depressions, winds between 63 and 118 kilometers per hour are classified as tropical storms and winds of 119 kilometers per hour and greater are typhoons. In the Atlantic, U.S. meteorologists refer to typhoons as hurricanes and classify them according to the five-tier Saffir- Simpson scale. Category 4 storms have winds of between 210 and 249 kilometers per hour. Centenas de milhar de pessoas foram esta quinta-feira, evacuadas das regiões costeiras do sul do Bangladesh e do leste da Índia, no golfo de Bengala, devido à ameaça da passagem, esta noite e amanhã, do ciclone Sidr. De acordo com o serviço meteorológico do Bangladesh, este ciclone regista ventos muito fortes que podem atingir os 220 quilómetros por hora, acompanhado de chuvas fortes e poderá atingir até ao fim do dia as zonas costeiras daquele país. O Bangladesh, regularmente atingido por catástrofes naturais, está sob alerta de ameaça do ciclone Sidr, desde a passada quarta-feira. Segundo os serviços meteorológicos dos Estados de Bengala Ocidental e de Orissa (Leste), a população da Índia recebeu o alerta de ciclone na passada terça-feira. Este tipo de catástrofes naturais são habituais nos meses de Outubro e Novembro, no golfo de Bengala, entre as costas orientais da Índia, as do sul do Bangladesh e o oeste da Birmânia. Um ciclone atingiu nesta quinta-feira o litoral sul de Bangladesh, na Ásia, deixando uma pessoa morta e milhares de desabrigados. Os ventos que chegaram a 240 quilômetros por hora provocaram corte no sistema de comunicação do país, o que torna mais difícil a obtenção de novas informações sobre mortos ou feridos. Sidr, como é chamado o ciclone, já obrigou 350.000 pessoas a deixarem suas casas. "Os primeiros informes enviados por correspondentes indicam que o fenômeno arrasou um número incalculável de casas confeccionadas com bambu e palha", informa a agência local de notícias UNB. O Sidr agora já se encaminha para a Índia. Regiões de Bangladesh localizadas na fronteiras entre os dois países sofreram cortes de energia. Mais de 40.000 homens, entre policiais, soldados e voluntários, foram distribuídos ao longo da costa para auxiliar a população. Espera-se que o ciclone atinja também o oeste de Mianmar. O ciclone Sidr, com ventos que podem atingir 240 quilómtros/hora, atingiu hoje o sul do Bangladesh, onde destruiu milhares de casas e obrigou 650.000 residentes a procurar refúgio em zonas abrigadas, anunciaram as autoridades locais. Os serviços meteorológicos do Bangladesh receiam que a forte tempestade provoque ondas que poderão atingir seis metros de altura. Se isso acontecer, poderão ocorrer graves inundações em 15 distritos costeiros do país. As áreas situadas num raio de 250 quilómetros do olho da tempestade foram atingidas nas últimas horas com ventos e chuva muito fortes e ondas altas, disse Mozharul Islam, um responsável florestal em Khulna, 135 quilómetros a sudoeste da capital, Dacca. Desconhece-se ainda se a tempestade provocou vítimas, mas as equipas de socorro estavam em alerta, segundo Mozharul Islam. Pelo menos 650.000 pessoas já foram retiradas das zonas que poderão ser afectados, tendo sido transportadas para abrigos anti-ciclone, onde receberam rações de campanha, disse em Dacca Ali Imam Majumder, do governo do Bangladesh. No entanto, as autoridades admitem que seja necessário abrigar 3,2 milhões de residentes. O governo enviou para as áreas afectadas alimentos secos, medicamentos, tendas e cobertores, referiu Majumder. «Tomámos todas as precauções», acrescentou. Os serviços meteorológicos da Índia alertaram também que a tempestade poderá provocar inundações nas zonas costeiras dos estados de Bengala Ocidental e Orissa, no leste do país. O Bangladesh, um país pobre da Ásia do sul regularmente atingido por catástrofes naturais, está sob alerta desde quarta-feira, com a aproximação do ciclone Sidr, que há dois dias ganhou força no golfo de Bengala. Em 1970, cerca de 500.000 pessoas morreram no Bangladesh na sequência da passagem de um tufão e em 1991, um maremoto causou perto de 138.000 mortos. Em 1999, o estado indiano de Orissa foi atingido por um furacão que causou pelo menos 10.000 mortos. Os ciclones são frequentes em Outubro e em Novembro no golfo de Bengala, entre as costas orientais da Índia, as do sul do Bangladesh e o oeste da Birmânia. Milhares de residências foram destruídas por ventos de entre entre 220 e 240 km/h que varreram o litoral sul de Bangladesh, causando também o corte no sistema de comunicação. "Os primeiros informes enviados por correspondentes indicam que o fenômeno arrasou um número incalculável de casas confecccionadas com bambu e palha", informa a agência de notícias local UNB. Vários distritos na fronteira com a Índia ficaram sem energia elétrica. O ciclone Sidr atingiu o país nesta quinta-feira deixando uma pessoa morta até agora e começa a tocar o leste da Índia, segundo as autoridades locais, que falam da pior tempestade dos últimos anos na região: 350.000 pessoas foram retiradas de suas casas. Um funcionário do ministério de Gestão das catástrofes naturais estima "enormes prejuízos materiais". 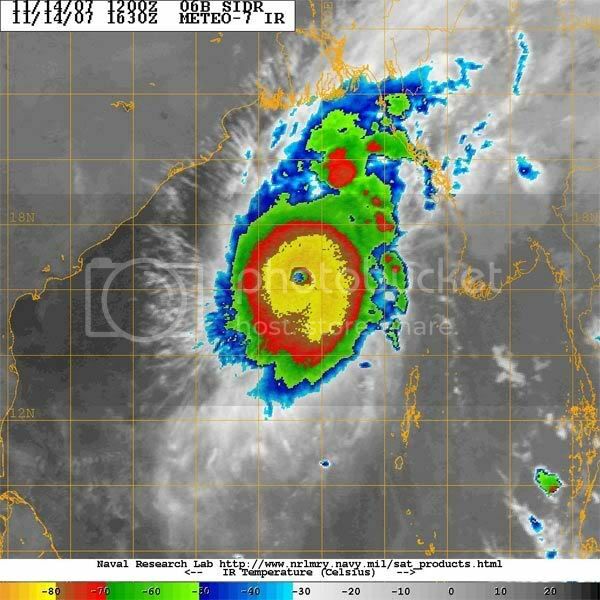 O SIDR fez ontem à tarde por volta das 14:00 o landfall, provavelmente como Cat4, com ventos que podem ter chegado aos 240 km/h, o 2º mais intenso ciclone tropical a quando do landfall no Bangladesh. A zona de impacto inicial foi nas Sundarbans, o mais extenso mangal do mundo, portanto uma zona bastante despovoada,ao contrário do restante país e do sul da India. Mas o maior problema no Bangladesh é a água, devido ao storm surge e à precipitação. O pico do Storm surge coincidiu com uma maré média e a descer, ao contrário do que sucedeu noutras ocasisões. Após o Landfall o SIDR deteriou-se rapidamente como é normal, mas a remanescente tempestade tropical passou muito próximo da cidade de Dahka, com 3 milhões de habitantes. Como já foi dito anteriormente, o Bangladesh é muito sensível a tempestades e à subida do nivel das águas. Boa parte do país está a menos de 10m acima do nivel do mar. E é um país densamente povoado. Para se ter uma ideia, o Bangladesh tem uma área 56% superior a Portugal mas vivem lá 145 milhões de pessoas. Do lado indiano também vivem outras 100 milhões de pessoas. A acrescentar a tudo isso está a própria configuração em "V" do Golfo de Bengala, que provoca as maiores storm surges do mundo. Ainda é cedo para ter uma ideia geral do que se passou, mas seguramente muita gente morreu. Resta esperar que também possam ter sido salvas muitas centenas de milhar, ao contrário do que sucedeu em anteriores ciclones. «O número de mortos aumentou para mais de 200 e continuamos a receber informações sobre pessoas mortas». O mais certo é este número aumentar e mto. Já estão contabilizados mais de 500 mortos, mas infelizmente o número final poderá ser bem superior. “We are here in the blackest black of darkness and God only knows what’s coming our way next,” Bangladeshi journalist Salah Uddin Shoaib Choudhury told Canada Free Press (CFP) in a static-charged telephone interview a few minutes ago. Although hit by flying debris and facing chaos all around them, Choudhury and his immediate family members came through last night’s severe cyclone without loss to life or limb. That news was relief to Chicago professor Richard Benkin, who Choudhury calls “my brother”. To get an inkling of the scope of the massive loss of life in the aftermath of the cyclone, one thousand fishermen alone are missing. Fishing is a way of life in this poverty-stricken country and although storm warnings were repeatedly made in advance of the coming cyclone, many small craft are not equipped with radios and put out to sea each day with only the confidence that comes from word of mouth. Before the count for missing boats got underway, at least 150 trawlers were missing. Collapsing houses and flying debris were the two main factors in fatalities. With world media attention focused on the cyclone, a devastating tidal wave was claiming its deadly toll. “There has been a tremendous loss to the huge mangrove forest in the southern part of the country and the tremendous loss to our wildlife will be staggering,” Choudhury told CFP. All cell phones are still out in Bangladesh, but the telephone in Choudhury’s home was working the morning after Cyclone Sidr, with its 250 kph (155) winds struck. On the coast, 15-foot- (5-metre) high tidal waves wiped out three coastal towns, forcing 3.2 million people to evacuate. Friday is a holiday in the primarily Moslem country, and Choudhury who didn’t have to go to his office was confident that the headquarters of his publication, The Weekly Blitz would still be standing. Darkness came for Dhaka and other major cities across the country at sunset. Power plants and most distribution systems damaged by the cyclone could take up to three days to restore services, according to power department officials. Disease and looting are concerns to go along with mass hunger even before mop up can begin. Agriculture officials said rice and other crops in the cyclone-battered areas had been badly damaged, adding to the suffering of villagers who had lost two crops in the floods. “Life shall never be easy,” said Mohammad Salam, a farmer in Khulna. “We are destined to suffer”. Choudhury, who works with Dr. Richard L. Benkin on “strengthening the bonds of understanding of different faiths”, had only returned to his home country from Monaco where he was presented with the international Monaco Media Forum prize, presented by Prince Albert 11, only two days before the cyclone hit. The celebrated journalist who was arrested in 2005 on his way to visit Israel and imprisoned for 17 months by Bangladeshi’s Muslim government was held in court all day yesterday, where Judge Azizul revoked his bond. Dhaka - A grim picture emerged Saturday as a massive search and rescue operation revealed decaying bodies in southern Bangladesh tossed by a devastating cyclone that officials said left at least 2,388 people dead and hundreds missing. More than 5,000 people were injured in the worst-affected coastal belt, rescuers said. Many devastated areas were cut off to rescuers by uprooted trees, broken culverts and fallen power poles. About three million people spread over 15 stricken districts had become homeless as their mud and straw houses collapsed in the wild winds, according to local charities. As thousands of soldiers and civilian volunteers went into action in the pummelled region, rescuers counted another 400 bodies of people killed in Friday's cyclone which also triggered mudslides and flash floods. Most deaths occurred in the Patuakhali-Barisal zone and on offshore islands where nearly 550 people, including children, were found dead, said a spokesperson of the national flood warning and control centre. Authorities were still having trouble late saturday restoring power after the national grid suffered heavily. Tens of thousands of flooded dwellings were washed away by the tidal surges while receding from isolated marooned hamlets. Cyclone Sidr, of hurricane strength, unleashed its full fury on the coastal belt the home of over 42,000 fishermen and their families. The storm also struck Dhaka and its suburbs, killing 11 people and injuring 500 as trees were plucked by the raging winds which reached speeds touching 250 kilometres an hour. The national meteorological centre warned of further heavy rains across the country in the coming days.